On 8 December, the United Nations Security Council was briefed by Under-Secretary-General for Peacekeeping Operations Hervé Ladsous, Head of the United Nations Office to the African Union and Special Representative to the African Union Haile Menkerios, and Acting United Nations Interim Security Force for Abyei (UNISFA) Force Commander Major-General Halefom Moges on the situation in Sudan and South Sudan under resolution 2046 (2012) and the situation in Abyei. The members of the Security Council welcomed the 4 November visit to Khartoum by South Sudan President Salva Kiir for talks with Sudan President Omer al-Bashir. The Council members also welcomed the stated commitment of both Presidents to implementation of 27 September 2012 Cooperation Agreements, particularly on security matters, and the establishment of a humanitarian corridor from Sudan to facilitate the provision of humanitarian assistance to the affected populations in South Sudan, but noted with concern that there has been no further progress on the agreements since November 2013. They called upon the Government of Sudan and the Government of South Sudan to hold a high-level security committee meeting as soon as possible, and to fully implement the Joint Border Verification and Monitoring Mechanism (JVBMM), in accordance with Security Council resolution 2046 (2012) and the 24 April 2012 African Union Peace and Security Council Roadmap, Joint Political and Security Mechanism, and other agreed joint mechanisms to ensure the security and transparency of the Safe Demilitarized Border Zone (SDBZ), including the “14 Mile Area”. The members of the Security Council reiterated their grave concern about the dire humanitarian situation resulting from continued fighting in the South Kordofan and Blue Nile States in Sudan. They called on all parties to refrain from any acts of violence against civilians and to expedite safe and unhindered humanitarian access for the timely and full delivery of humanitarian aid to all civilians in urgent need of assistance. The members of the Security Council welcomed the recent peace talks between the Government of Sudan and Sudanese rebel groups under the auspices of the African Union High-Level Implementation Panel (AUHIP) in Addis Ababa, Ethiopia. While noting the progress made, they expressed regret at the absence of a final agreement. The members of the Security Council renewed their calls upon the Government of Sudan and SPLM-N to cease hostilities, engage in the next round of direct talks without conditions in January as planned by the AUHIP, and make the necessary concessions to reach agreement on ending the conflict in South Kordofan and Blue Nile States in accordance with provisions of resolution 2046 (2012). The members of the Security Council reiterated their grave concern about the relatively calm but highly volatile security situation in Abyei Area, and the absence of progress in implementing the 20 June 2011 Agreement on Temporary Arrangements for the Security and Administration of the Abyei Area as reported by the Secretary-General, while condemning the recent deadly attacks on civilians. They welcomed the 5 December appointment of the South Sudan Co-Chair of the Abyei Joint Oversight Committee (AJOC) and urged the immediate resumption of the work of the AJOC without preconditions. 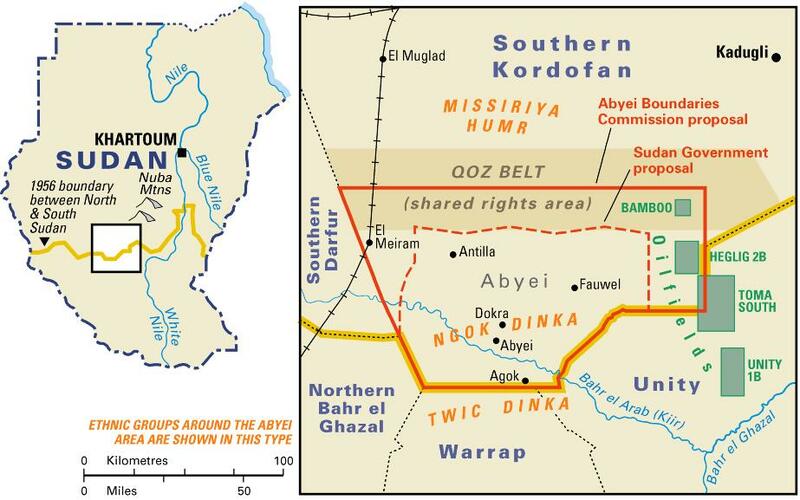 Further, they reiterated their demand in resolution 2179 (2014) that Sudan and South Sudan urgently commence the establishment of the Abyei Area Administration and Council, and constitute the Abyei Police Service, to enable it to take over the policing functions through the Abyei Area, including the protection of oil infrastructure. The members of the Security Council further reiterated, in accordance with relevant resolutions, in particular resolutions 1990 (2011) and 2046 (2012), that the Abyei Area shall be demilitarized from any forces, as well as armed elements of the local communities, other than UNISFA (United Nations Interim Security Force for Abyei) and the Abyei Police Service. The members of the Security Council recalled their decision in resolution 2046 (2012) that Sudan and South Sudan shall unconditionally resume negotiations under the auspices of the AUHIP and with the support of the Chairman of IGAD (Intergovernmental Authority on Development), to reach agreement on critical issues, including final status of the Abyei Area. To this end, they urged UNISFA, the African Union, and the Federal Democratic Government of Ethiopia to work in collaboration with the Governments of Sudan and South Sudan, to use creative provisions based on mutual understanding to expedite implementation of the outstanding administrative and security elements of the June 2011 Agreement, as appropriate, in order to address the law and order vacuum in Abyei within the context of inter-communal dialogue. The members of the Security Council called for steps to enable, inter alia, the withdrawal of the Oil Police in Diffra while ensuring the security of oil installations, resuming the AJOC meetings, and resolving the dispute over the May 2013 killing of the Ngok Dinka Paramount Chief.